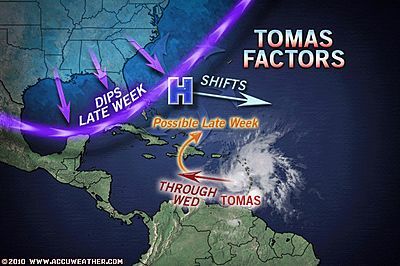 The latest information from Accuweather suggests a strong jet stream could turn Hurricane Thomas into Haiti. Another unusual aspect of Tomas’ formation is that we now have two simultaneous hurricanes in the Atlantic Ocean on October 30. There has been only one hurricane season since 1851 that had had two simultaneous hurricanes later in the year–1932, when Hurricane Ten and Hurricane Eleven both existed November 7 – 10. Today is also the 5th latest date in the season that there have been two simultaneous named storms in the Atlantic. The record was set way back in 1887, when Hurricane Eighteen and Tropical Storm Nineteen were both active on December 8. There were three years that had simultaneous November named storms: 1932, 1961, and 2001. Seems to me the effective way to fight this new weapon system is look for the gray containers with no writing! Bev and I joined about 45 other people to participate in the 8th Annual Charles Loftus-Cole Memorial Work Day at the Oregon Food Bank. Charles Loftus-Cole was the son of our friends Jane Loftus and Sam Cole who was killed in an auto accident eight years ago at 16 years of age. This was my first time at the Food Bank and Bev’s second. Eight people gathered around each metal stainless table and scooped oats from a giant pillow shaped plastic bag into plastic bags measuring two pounds. We all worked hard from 1:00pm to 3:00pm. When we were done, we had bagged 8,000 pounds of oats. That’s enough to feed 65,000 people! When people are suffering in Oregon due to a lack of resources to buy food, the Oregon Food Bank provides relief. During 2009-10, the Oregon Food Bank Network distributed 72-million pounds of food to people in need throughout Oregon and Clark County, Wash. The reports come on the heels of the 2009 U.S. Census Bureau poverty report, which reports that the ranks of the working-age poor climbed to the highest level since the 1960s, leaving one in seven Americans in poverty. You can help. Go to their website and read how you can volunteer. Pajamas Media has story about La Nina and this winter weather. We could be in for a type of weather last seen in the late ’40s and early ’50s. This La Nina appears to be special, at least so far. It is well on its way to being the strongest of these events since the super La Nina of 1955-1956. During that powerful La Nina that lasted two years, the global average temperature fell nearly one degree Fahrenheit from 1953 to 1956. Do Non-citizens have a right to vote? Do Non-citizens have a right to vote? Some cities are considering giving non-citizens the right to vote. They think they should have a say on issues that affect them. Historically, 40 states allowed noncitizens to vote going back to 1776, but an anti-immigrant backlash in the late 1800s and early 1900s resulted in laws that eliminated their voting rights by 1926. If we allow non-citizens to vote, where’s the advantage of citizenship?